Enter your organization's login link into your browser's web address bar. It will resemble the following example: https://myorganization.theworxhub.com. *Note: Your URL will be specific to your organization, and typically contains the name or abbreviation of your organization within the URL. If you do not know your login link, contact your account administrator. https://mycommunityname.theworxhub.com. *Note: There is no www at the beginning of the link. The easiest way to access TheWorxHub is to create a 'favorite' or 'bookmark' in your favorite web browser. 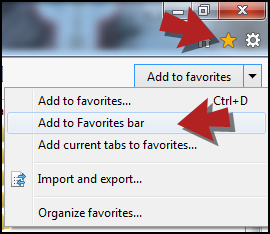 Below are instructions for creating a favorite or bookmark in a few of the most common browsers. Type your URL for TheWorxHub into the address bar at the top of your browser window, then press Enter. Once TheWorxHub login page loads, click on the star icon in the top right corner of the screen. Click on the down arrow beside Add to Favorites and select Add to Favorites Bar. Once TheWorxHub login page loads, click on the three dot icon in the top right corner of the screen. Once TheWorxHub login page loads, click on the star icon at the top right of the screen. Make sure Bookmarks Toolbar is selected. Once TheWorxHub login page loads, click on the share icon at the top of the screen. Click Add in the pop-up window that appears. A page loads allowing you to specify a new password. We recommend using a secure password that includes letters, numbers, and a symbol. Once you've typed your new password and confirmed it, click the Reset button to save your new password. 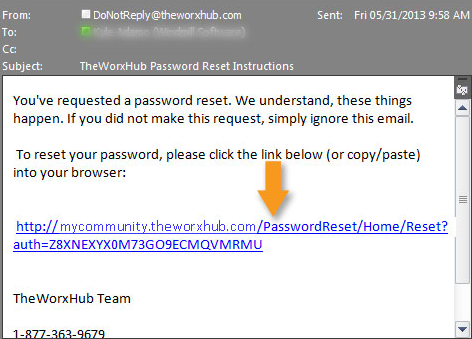 *Note: If your email address is associated with multiple user accounts in TheWorxHub, this page will provide a pick list of usernames so you can choose the correct username to reset. Click on your login name in the upper right corner of the page. In the Password section, enter your Old Password. Choose a new password and enter it into both the New Password and Confirm Password fields. *Note: We recommend using a secure password that includes letters, numbers, and a symbol. Live Chat - Click this link to be connected with live member of our Legendary Support Team. Email Support - Click this link to open your email client and email our Legendary Support Team. Visit Help Site - Click this link to open our Help Site for TheWorxHub. Logout - Click this link to safely exit TheWorxHub application. Go to Profile - Click this link to edit your personal account within TheWorxHub. Home - This will bring you back to the start page. Rounds - This tab allows you to see and manage deficiencies. *Note: This tab will only appear for clients that have purchased this additional feature. If you are interested in managing deficiencies in TheWorxHub, please contact your sales representative. Search - Opens the search feature. Calendar - This will open the calendar. Reports - This tab opens the reporting tool, showing you any reports you have saved as a favorite by default. Settings - Takes you to your WorxHub account settings. Actions - Opens various actions features such as batch updates and barcoding. To the left of the Help link is the Bulletins button. Clicking this button will expand a side panel where you can view all active bulletins available for display. *Note: If there are no active bulletins, the Bulletins button will not display. Click mark as read to reduce the number of unread bulletins advertised on the banner. As long as there are bulletins that have not been read, the button will display as red. Click mark all as read to reduce the number of unread bulletins advertised on the banner to 0. When all bulletins have been read, the button will turn green. Click on the ( ) icon to view the bulletins side panel as a full screen window. *Note: This can be used to display bulletins on an external display, such as a Monitor or TV. If there are too many bulletins to fit within the full screen view, they will automatically scroll on a timer. The Smart tabs feature provides you with a quick and easy way to go back to the two most recently used records. TheWorxHub creates a separate Smart tab for each new record you produce and adds it to the Smart tab display across the top of your workspace. Just clicking once on a Smart tab instantly returns you to the record it represents. To the left of the Smart tabs is the Recent History icon. Click this to list the last 10 items you have viewed. Click any item in the list to return to that page. Overview - The overview dashboard tab shows a breakdown of work orders as well as any reminders. Check out the link to learn more about the Overview tab. Pulse - The Pulse tab shows a quick overview of what's going on at your organization. Click the link to learn more about the Pulse tab. Projects - The Projects tab allows you to quickly access options to manage and create projects for your organization. Requestor - This tab allows you to see the requestor portal. The Department tabs control what type of work the dashboard tabs will display. For example, if IT Services is selected, the Overview dashboard tab will only show IT Services Work Orders. The departments that will display on your Dashboard will differ depending on what additional applications your organization has purchased. *Note: If you are interested in purchasing additional applications, please contact your sales representative.